Massive military exercises and a troop buildup on NATO’s eastern flank reflect a dangerous new strategy. By preparing for war, Washington and NATO are setting in motion forces that could achieve precisely that outcome. The budgetary and force-deployment implications of this are enormous in their own right, but so is this embrace of “great-power competition” as a guiding star for US strategy. During the Cold War, it was widely assumed that the principal task of the US military was to prepare for all-out combat with the Soviet Union, and that such preparation must envision the likelihood of nuclear escalation. Since then, American forces have seen much horrible fighting in the Middle East and Afghanistan, but none of that has involved combat with another major power, and none entailed the risk of nuclear escalation—for which we should all be thankful. Now, however, Secretary Carter and his aides are seriously thinking about—and planning for—conflicts that would involve another major power and could escalate to the nuclear realm. It’s hard to know where to begin when commenting on all this, given the atmosphere of Cold War hysteria. There is, first of all, the question of proportionality: are US and NATO moves on the eastern flank in keeping with the magnitude of the threat posed by Russia? Russian intervention in Crimea and eastern Ukraine is certainly provocative and repugnant, but cannot unequivocally be deemed a direct threat to NATO. Other Russian moves in the region, such as incursions by Russian ships and planes into the airspace and coastal waters of NATO members, are more worrisome, but appear to be more political messaging than a prelude to invasion. Basically, it’s very hard to imagine a scenario in which Russia would initiate an armed attack on NATO. Then there is the matter of self-fulfilling prophecies. By announcing the return of great-power competition and preparing for a war with Russia, the United States and NATO are setting in motion forces that could, in the end, achieve precisely that outcome. This is not to say that Moscow is guiltless regarding the troubled environment along the eastern front, but surely Vladimir Putin has reason to claim that the NATO initiatives pose a substantially heightened threat to Russian security and so justify a corresponding Russian buildup. Any such moves will, of course, invite yet additional NATO deployments, followed by complementary Russian moves, and so on—until we’re right back in a Cold War–like situation. Finally, there is the risk of accident, miscalculation, and escalation. This arises with particular severity in the case of US/NATO exercises on the edge of Russian territory, especially Kaliningrad. In all such actions, there is a constant danger that one side or the other will overreact to a perceived threat and take steps leading to combat and, conceivably, all-out war. When two Russian fighters flew within 30 feet of a US destroyer sailing in the Baltic Sea this past April, Secretary of State John Kerry told CNN that under US rules of engagement, the planes could have been shot down. Imagine where that could have led. Fortunately, the captain of the destroyer chose to exercise restraint and a serious incident was averted. 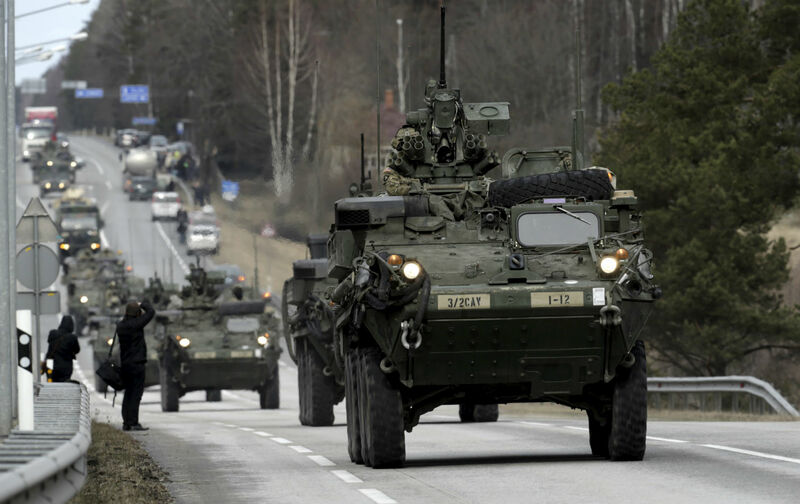 But as more US and NATO forces are deployed on the edge of Russian territory and both sides engage in provocative military maneuvers, dangerous encounters of this sort are sure to increase in frequency, and the risk of their ending badly will only grow. No doubt the NATO summit in Warsaw will be overshadowed to some degree by the UK’s Brexit vote and ensuing political turmoil in Europe. But as Western leaders settle down to business, they must not allow their inclination to “demonstrate unity” and “act resolutely” lead them to approve military moves that are inherently destabilizing. Surely it is possible to reassure the Baltic states and Poland without deploying many thousands of additional troops there and inviting an additional military buildup on the Russian side. Michael T. Klare Twitter Michael T. Klare is a professor of peace and world security studies at Hampshire College and the defense correspondent of The Nation.